It has been ten years since the birth of Google Play. Launched originally as The Android Market on October 22 in 2008 with barely a dozen apps to its name, Google’s App Store houses 2.6 million apps – playing a major role in transforming our entire economy. That’s why it seems like a good time to explore an interesting retrospective of the store. App Annie has created a report into the history of the store – called “The Data Behind 10 Years of Google Play” – which looks at where the store came from, where it is today and where it’ll go in the future.So what did we learn from the report? 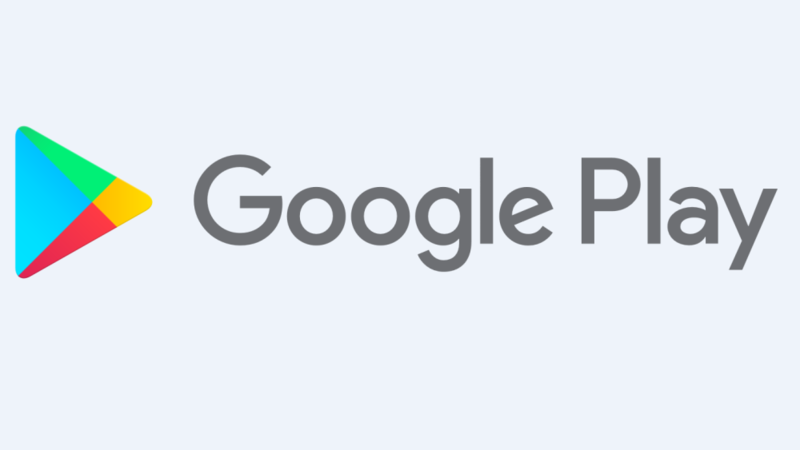 Here are four things that we have learned from App Annie’s analysis of the ten years of Google Play. The Google Play Store has always had a reputation of being a store which drives downloads first and revenue second. App Annie’s research indicates that the first part of that story is true, but that the second element is changing quickly. According to its figures, the store has generated more than double the number of downloads than the App Store has. In total, App Annie pegs the figure at 330 billion installs between early 2012 and the summer of 2018. That means – on average – every person in the world would theoretically have downloaded 50 apps on Google Play. However, App Annie also indicates that Google Play is catching up in the revenue stake. While Apple users might still spend about twice as much money as Google Play Store users, revenue has nearly doubled between 2015 and 2017 hitting $22 billion. 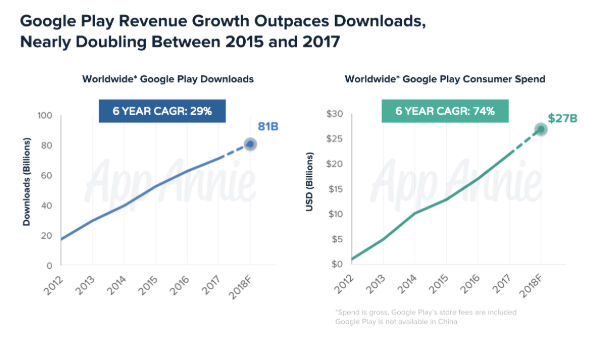 And with App Annie predicting that annual consumer spend will reach $42 billion in 2022, it is possible that Google Play’s enormous install base may translate into iOS style revenues in the future. Over the ten years of Google Play’s existence, nearly 10 million apps have been released on the platform. While 83% of those releases have been apps, the smaller portion of mobile games has undoubtedly had a bigger commercial impact. While 17% of Google Play releases that are categorised as games account for an impressive 41% of all downloads, they accounted for an even more impressive 88% of all spend. This can be broken down on a regional and annual basis too, with the Asia-Pacific market spending $10.1 billion on games in 2017 compared to just $0.9 billion on apps. Why the discrepancy? Well, a large part of it comes down to the comparative maturity of mobile free to play games. With games like Clash of Clans, Candy Crush Saga, Puzzles and Dragons, Game of War and Monster Strike generating enormous free to play revenues early, games businesses were able to both rack up incredible revenue figures and monopolise the talent capable of driving success on mobile app stores (such as user acquisition experts).However, apps are very much on the up at the moment. Subscription services such as Netflix, Spotify and Tinder have unlocked long-term revenue streams, while disruptive services like Uber and Deliveroo have built entire new sub-sections of the economy to serve their ‘just in time’ service offerings. As a result, more apps than ever are making big money on Google Play. 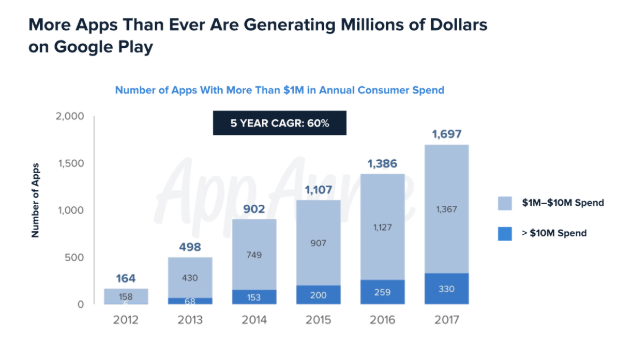 In 2018 over 1,500 apps made over $1 million in annual consumer spend, with 330 of those exceeding $10m in a year. This is signs of a broadening of the app economy, potentially leading to growth in the coming years. China has had a tense relationship with Google since most of its services were blocked back in 2010. As a result, China does not currently have access to the Google Play Store and its enormous Android market is not referenced in the report. However, despite China’s absence, Asia-Pacific still accounts for over 50% of Google Play’s consumer spend. In 2017 Asia-Pacific spent $11.1 billion on the app store while Europe, Middle East and Africa spent $4.8 billion and the Americans spent $6.1 billion. 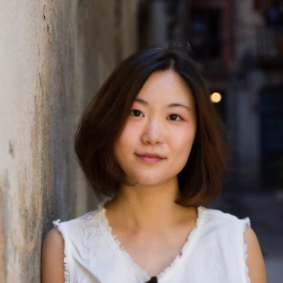 App Annie attributes the rise of the region to Google’s expansion of carrier billing to more markets in Asia-Pacific such as Taiwan, Thailand and Singapore. Prior to 2012, the service in the region was only available to South Korea and Japan. But with it being rolled out to South East Asia – and supported by strong uptake of low-cost Android handsets in the region – Google Play was better placed than the App Store to cater to this rapidly developing market; ensnaring consumers along the way. Finally, while the most downloaded games of all-time were coming from Europe, games from Asia-Pacific have made the most money. Six of the top 10 games with the most all-time worldwide consumer spend are made in Asia-Pacific. Japan leads the chart with its hugely successful Puzzles and Dragons by GungHo Online Entertainment followed by Mixi’s Monster Strike. Korea also has two top ten entries from NCSOFT and Netmarble, while China’s international-facing publisher Elex Technology rounds out the top ten with Clash of Kings.Furthermore, companies originating from the Asia-Pacific region have also benefitted from consumer spend on Google Play more widely. 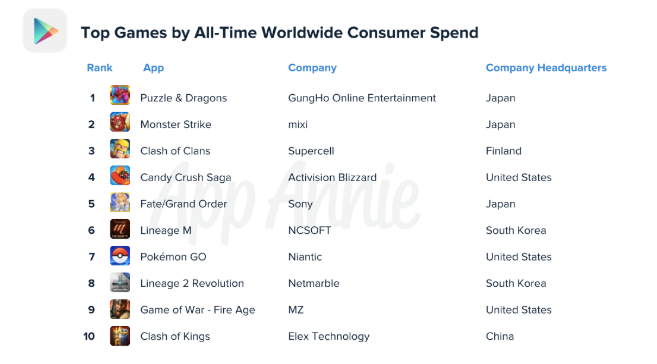 South Korea’s Netmarble along with Japan’s GungHo Online Entertainment, mixi, Bandai Namco, LINE and Sony have all made it to the top ten companies with all-time Google Play consumer spend in games. And to top it off, Chinese companies, in particular, have made a splash in the all-time download charts. Four of the ten companies with the most downloads outside of games are Chinese. Gomo and Cheetah Mobile are in the top three, with Alibaba Group in fifth place and Baidu in seventh. Meanwhile, the Chinese company Doodle Mobile holds the crown as the top company with the most all-time downloads of their games in a sea of European companies.So even without direct access to China’s lucrative market, Google has built much of its store’s success off the back of the region as a whole. Want to find out more about the history of Google Play and the most popular apps of all time? Download App Annie’s report here.